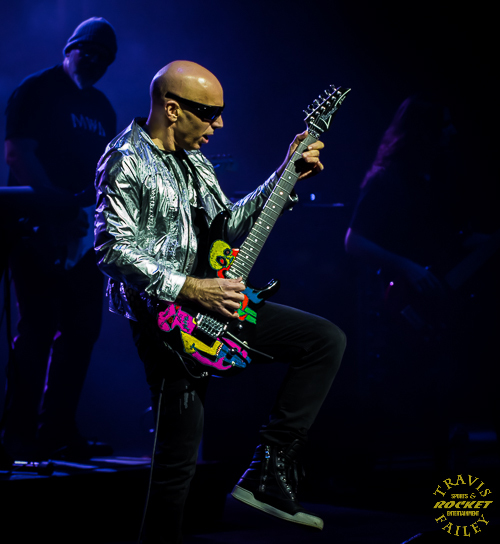 KNAC.COM - Reviews - JOE SATRIANI In Clearwater, FL With Photos! 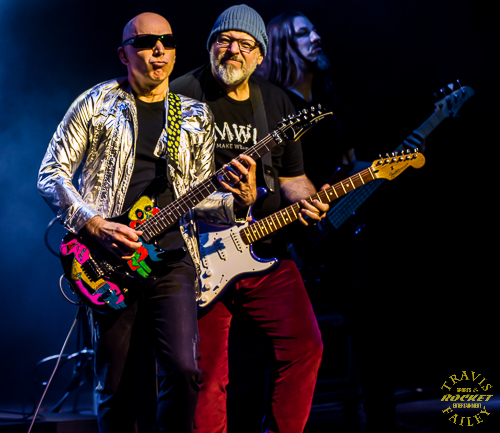 JOE SATRIANI In Clearwater, FL With Photos! In the early 80’s, there were a few guitarists whose names were synonymous with the instrument that they played and the bands they played with. Iommi, Page, Perry and of course: Van Halen. These axemen not only contributed greatly to the next generation of standout guitar players in Lynch, Mustaine, Wylde and Dimebag, to name a few, but they also opened the door for a new breed: the guitarist who developed his own sound, was able to produce albums, and tour as a solo act with his guitar playing and composing at the forefront. Many tried and only a few were successful, which led them back to utilizing the band formula that was tried and true. One player though really stood out and 30 years later, Joe Satriani still remains relevant. 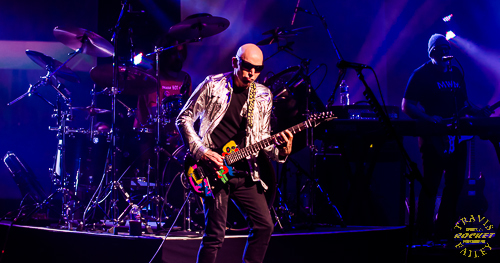 Satriani brought his Shockwave Supernova Tour to Ruth Eckerd Hall last Thursday night. Satriani and his band performed two sets and an encore, totaling over two and a half hours to an appreciative packed house. Initially it looked like the crowd was going to be considerably smaller than usual for this show at Ruth Eckerd. 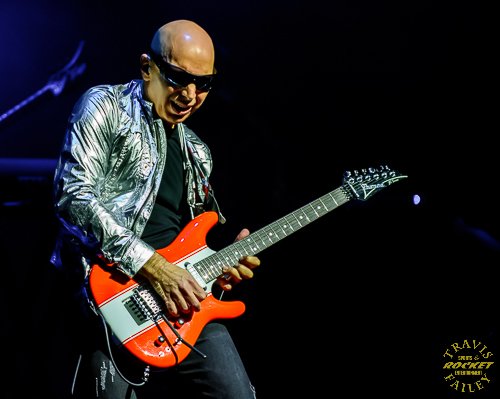 Many thought that there was an opener as in previous tours, but this was billed as an “Evening with Joe Satriani”, celebrating 30 years of music after he released his debut album, Not Of This Earth, in 1986. His next release, Surfing With The Alien, put Satriani on the map and he was no longer known as “just an instructor” of guitar heroes in Steve Vai and Kirk Hammett. Surfing With The Alien attacked multiple senses by initially capturing the eye of the concertgoer by utilizing a flashy comic book character on the cover and then by taking the listener on a journey with the Silver Surfer. The album has an uplifting effect and Satriani has continued to utilize a lot of the same tones and themes 30 years later. Some music provides aggression, some sadness, some angst. Satriani…smiles. Tonight at Ruth Eckerd Hall in Clearwater, the smiles remained. 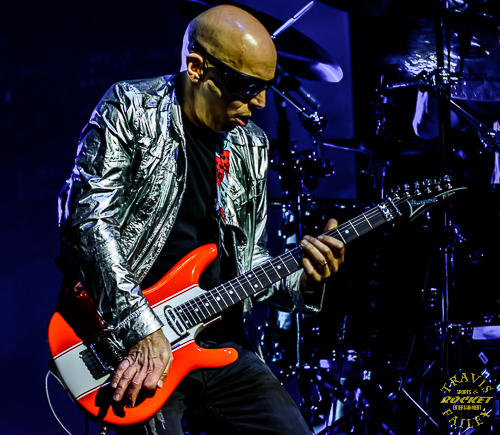 Satriani took the stage a in a flashy silver jacket and the band opened up with the title track from Shockwave Supernova and then took the crowd back in time to another title track, this one being from the 1989 release, Flying In A Blue Dream. I was hoping he would play more from this album as Joe sings quite a bit on it, more so than any other album in his career. Satriani sang once tonight: during the encore track “Big Bad Moon”. He also broke out the harmonica and played slide guitar during “Big Bad Moon” and the blues beats got the people grooving in their seats. Satriani removed his jacket and gave thanks to FOZZY frontman and WWE star, Chris Jericho, and then donned his patented black shirt and jeans throughout the night. 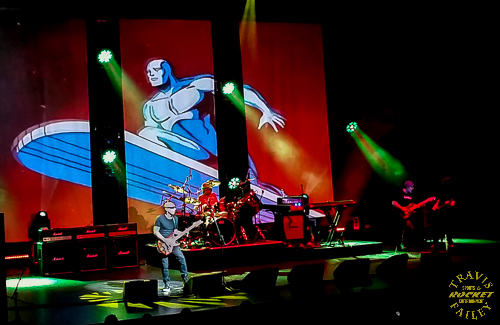 Satriani’s production team did an amazing job as the music was accompanied by breathtaking graphics on the big screens, which included mountaintops, skylines, and roadways that were perfectly in sync with the music throughout the show. Joe and his crew took you on a rollercoaster ride of sights and sounds. You almost thought that you were in a flight simulator traveling on an intergalactic journey, as Joe likes to use his alien and space background imagery to create visual perfection. The first set included another title track, “Not Of This Earth”, and his highest charting single in the U.S., “Summer Song”, which closed out the set. 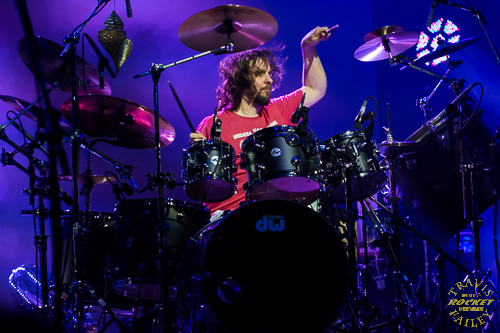 After a fifteen minute intermission, Joe and two of his band mates, guitarist/keyboardist Mike Keneally (Frank Zappa, Steve Vai), and bassist Brian Beller, took an extended break as drummer Marco Minnemann put on a display behind the skins. The drum solo set the tone for part two of the evening as Beller and Keneally also got a chance to show their soloing skills on their chosen crafts. Mike Keneally proved himself to be an invaluable part of the band equation by playing multiple instruments. His outstanding work behind the keyboard and switching seamlessly to the guitar, helped keep a musical balance without the main tones becoming stale. He also dueled with Satriani while playing the keyboard during, “If I Could Fly”. The second set also included an odd love song called “Butterfly And Zebra” and a surf infused track from Shockwave Supernova, “If There Is No Heaven”. There was an interesting occurrence during the song as cold blasts went through Ruth Eckerd Hall. It was strange in that this was the only time it happened throughout the night, and yes, I verified with others at the show that I wasn’t the only one getting hit with the sequenced cold blasts. Satriani closed out the second set with “Satch Boogie” and took a quick break and encored with the aforementioned “Big Bad Moon” and “Surfing With The Alien”. The tri-screen backdrop provided ample space for the “Surfer” to patrol the galaxy and battle his foes like they were Thanos and Mephisto. 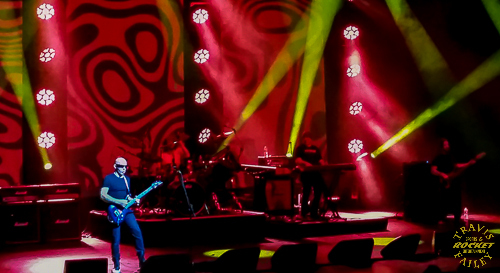 It was an amazing display of audio and visual synchronicity and a perfect ending to "An Evening With Joe Satriani".